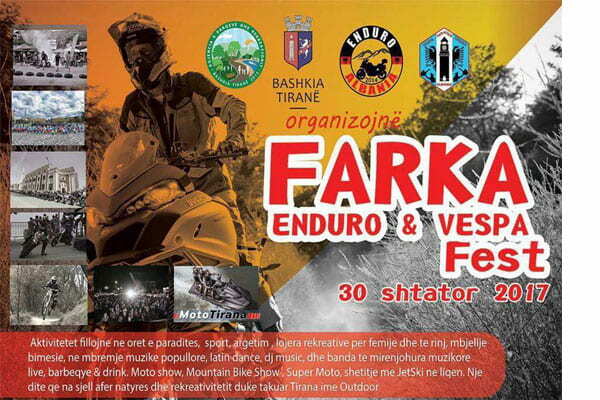 Enduro Albania, Vespa Fanatic Tirana, in cooperation with the Municipality of Tirana and the Agency for Parks and Recreation, organize Farka Enduro & Vespa Show Fest on September 30, 2017. Activities start in the early hours, including sports, entertainment and recreational games for children and young people, planting vegetation, to continue until late at night with folk rhythms, latin dance, dj music, and well-known music bands that will perform live, barbeque & drink. Emotions and adrenaline at 17.00 from Moto show, Mountain Bike Show.